Update 26 July 2017 - Story Spheres have been relaunched. 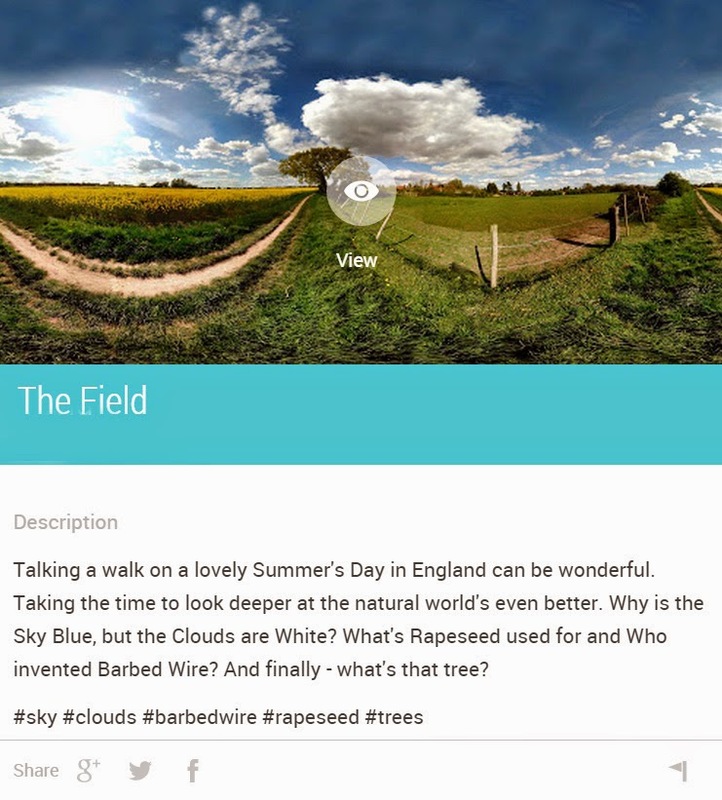 You can take a read of the official google blog 25 July 2017 'Helping journalists experiment with 360 content. With that in mind, I am now making and testing Story Spheres. 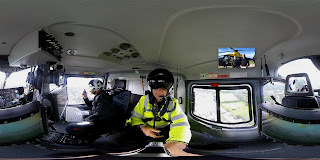 The first one today is called West Midlands Police NPAS Live which shows the interior of a UK Police Helicopter with background voice over from an officer. It's a single audio centred around the EXIT sign, near the slide of the helicopter on the ground. 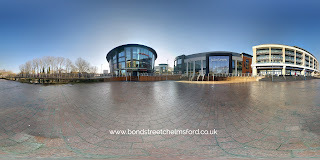 I've made one called Bond Street comprising x1 background audio and x5 clickable hotspot audio. 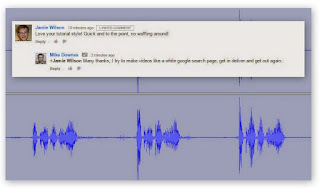 Watch and listen - the issue to iron out, how background audio is omnidirectional and will halt to zero when looking in 180 degrees away. I guess adding the same track but 180 degrees apart will work or better still, simply add audio that refers an exact spot ie inside a cafe or building. These days in 2017, there are many many more ways to make 360 images, more than ever before, especially in 2015. The real question is when and where story spheres will fit in. It's no secret I'm a fan of the #photosphere, so when I hear Grumpy Sailor teamed up with Google Creative again - a dream come true. On this page, you'll find some resources to get you started to view your first Story Sphere and understand what goes into the Making too. To make it simple, I've created a google collection which includes all the information from +Grumpy Sailor Creative and Google's +Tom Uglow. It's beta v1.0 and what comes with that is patience, a tremendous amount of fun and the ability to create and be part of something that's definitely on the edge of tomorrow. I'll be adding to this page in the next few days in the meantime - do some exploring. 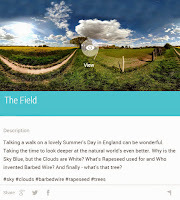 Click on The Field below and look for five audio files marked with a ♪ - when you line up the circle, the file will play. Simple as that. My Story Spheres (edit 31 May 2015) in order of newest first. 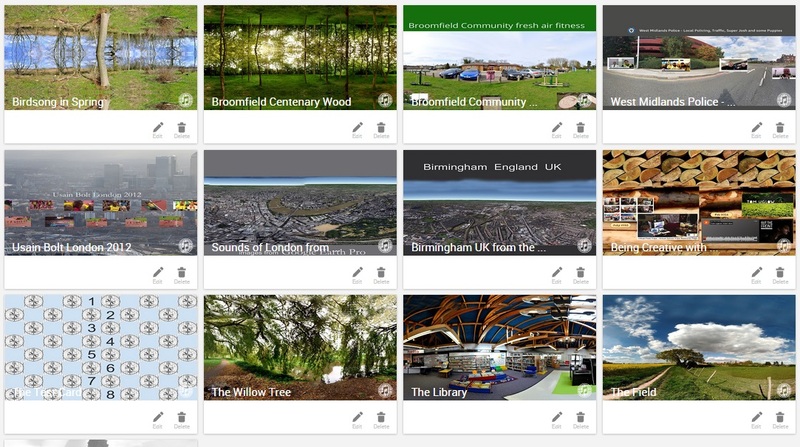 If you see any you like (mine or otherwise, save them as a favourite). If you are thinking about design, then Google IO ran a brilliant session on Designing for VR, here th link and I have a g+ collection for IO too. Here's the Intro video from Artexpress - Art Gallery New South Wales, Australia. You can read Grumpy Sailor's blog post too.